Star Wars: Battlefront II has drawn some pretty legendary backlash. A glance at any gaming news site will show you trending stories on Battlefront II’s failures, and even non-gaming media is taking notice due to its incredibly low sales. Battlefront II is a full $60 game that expects players to pay a truly insane number of microtransactions to access all of its content. While this behavior is considered semi-acceptable in Free To Play titles (less so if the content is non-cosmetic and ties to gameplay directly), it’s completely unprecedented for a full AAA premium game to lock so much behind microtransactions. The backlash was swift and justified, resulting in EA (Battlefront II’s publisher) managing to get the most-downvoted comment in Reddit history. Shortly thereafter, EA removed microtransactions from Battlefront II...or, more accurately, suspended them. Meaning that they will be coming back, and gamers need to be ready when that happens. Prior to the disappearance of microtransactions, a particularly savvy gamer estimated that the cost to get all of the content in Battlefront II would be...$2100. 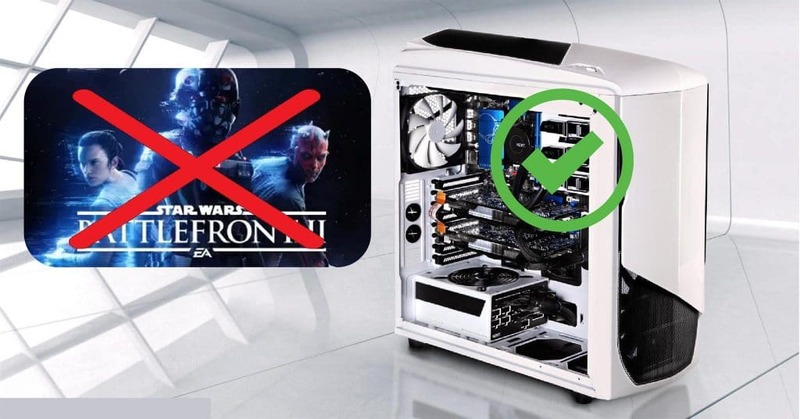 For those of you who actually have that much money to spend on video games, here’s a counter-proposal: check out our Better Than Battlefront II PC Build below. Depending on price fluctuation, you should also be able to fit a full $60 retail game of your choice into the budget...or you can just buy a better game or two on a Steam sale. If you can’t afford that much...you’re like most people. And don’t worry! We have plenty of budget builds on our site to get a more value-oriented PC gaming experience. Check those out if you want to save cash and get a great gaming experience! But if you can afford to spend $2K on gaming...and would rather turn it into something that can benefit your entire gaming experience rather than get the full content out of a single game...keep reading. CPU: Intel Core i7 8700K CPU COOLER: Corsair H75 Liquid CPU Cooler GPU: ASUS GeForce GTX 1080 Ti 11GB RAM: G.Skill Flare X 16GB Memory SSD: Crucial MX300 525GB Solid State Drive HDD: Toshiba X300 4TB Hard Drive PSU: Corsair RMx 750W 80+ Gold Certified Fully-Modular Power Supply MOBO: Asus TUF Z370 Plus Gaming Motherboard CASE: NZXT Phantom (White) Full Tower Case TOTAL: $1989.36 Here are the components for the Better Than Battlefront II PC Build. Note that peripherals, operating system and the such isn’t included here: if you need help with that, we provide those in our other build guides. Since these things can often be acquired for free or secondhand (and you may have them already! ), PC build guides in general don’t generally provide them. Comment below if you want recommendations, though. We’ll be happy to give them. The i7 line from Intel is known for its high core counts, higher thread counts, high clock speeds, and a whole number of other terms you can attach “high” to. Most importantly, high performance. The i7 8700K will provide best-in-class gaming performance in pretty much any title you throw at it, and in most cases will also have ample room for streaming and rendering in parallel. If you want a true powerhouse of a CPU and are willing to spend money for it, the i7 8700K is what you’re looking for. The i7 8700K doesn’t come with a cooler, so you need to buy one of your own. And since you’re buying a high-end overclockable processor, why not opt for a liquid cooler that’ll allow the CPU to reach its full potential? Wanna do 4K 60FPS? 1080/1440p 144FPS? This 1080 Ti can probably handle that for all but the most demanding games out there. While it’s not the best from a value perspective, it is the best GPU you can afford in this price range. The Titan V alone, for instance...costs an extra $1K on top of the price of this build. Ouch. 8GB RAM is perfect for most consumers, but this 16GB kit from G.Skill will ensure that you truly never have to worry about running out of memory. Unless you’re running virtual machines and servers on a gaming PC for some reason. An SSD is a huge quality-of-life improvement, and Crucial’s MX300 is among the best in price/storage/performance. You’ll have plenty of room for your OS and programs. You likely won’t fit all of your games here, but a few of your favorite titles (multiplayer games especially), will be well-suited for storage here. Honestly, this Toshiba HDD surprised me when I was looking for it. Since when can you get 4TB hard drives for a little over $100? Great value aside, you’ll be able to stuff pretty much everything you want on here. Make sure you install your OS on your SSD, though! The Corsair RMx PSU is comparatively modest when placed alongside other components in this build, but it’s more than adequate for powering it. Corsair makes awesome PSUs and has received industry-wide praise for it, and the 750W spec here is more than enough for this build’s estimated 471 wattage. Intense overclocking may start pushing it, though. Our Asus Z370 motherboard is packed with extra features, alongside generally-solid build quality and pleasing aesthetics. Most importantly, it also unlocks overclocking capabilities, so that you’ll be able to overclock your i7 to its fullest potential. NZXT’s high-end case completes the build, offering a side panel window for showing off your build and tons of room for extra cooling fans, ensuring your components have a long life without overheating. Also it looks pretty slick, but if you don’t like it you can always find another full or mid-tower case that better suits your tastes. Let’s face it: Battlefront II is a colossal failure, across-the-board. Even with its predatory pricing schemes, it’s plagued by intolerable server issues and a mediocre campaign that even the most loyal Star Wars fans have to endure. Whether paying $60 for the base game or thousands for the full content, it’s pretty much a fact at this point that your money is better spent elsewhere. We hope we’ve provided a viable alternative. In either case, screw EA. Comment below and let us know if you need any help!